31 Mar 2019 Washington, D.C.
Our biggest competitor in my view is probably China in terms of who’s going to win the 21st century. Is it going to be a free enterprise democracy with America, or is it going to be an authoritarian country like China? China has not been in a war since 1979. They are putting all their resources into building good will with other countries and into developing their airports, their bridges, their universities, their artificial intelligence. Why are we involved in wars that are not winnable that are costing us resources that are strategic in winning the 21st century? Instead of all the trillions of dollars that we have spent on these wars, imagine if we built our infrastructure, if we invested in our people, if we helped build our country to make sure that we win in the 21st century. I think that is a message that every American regardless of whether you voted for President Trump or whether you voted for a Democratic member of Congress can get behind because it’s for the national purpose and when it comes to winning in the 21st century I think we’re all on the same team. In the hyper-partisan era that is the Trump administration, Khanna has emerged as a unique voice in the Democrat Party. While he is certainly a progressive Democrat and harsh critic of the president and his administration on many things, he is also someone who is willing to work with Trump in places where he agrees with the president — particularly on ending wars he, like many in the grassroots of both sides of the aisle, view as endless. Khanna definitely has credibility on both sides of the aisle and is able to work seamlessly with voices as diverse as House Freedom Caucus chairman Rep. Mark Meadows (R-NC) and newly elected socialist firebrand Rep. Alexandria Ocasio-Cortez (D-NY). In fact, the night before this interview with Breitbart News a little over a week ago, Ocasio-Cortez praised Khanna on her Twitter account — a tweet highlighted by 2016 Democratic presidential nominee Hillary Rodham Clinton. But then in this interview less than a day after those Ocasio-Cortez and Clinton tweets, Khanna repeatedly cited efforts to work with both sides of the aisle including with President Trump and his administration, as well as the president’s top allies like Meadows and Sen. Rand Paul (R-KY) among others. Khanna even pitched meeting with Trump alongside others like Meadows and Paul as part of a bipartisan coalition to get the U.S. out of unnecessary foreign entanglements. Khanna says the reason why he is working with people on both sides of the aisle on this issue — and doing interviews like this one with outlets like Breitbart News — is because he senses a growing nonpartisan sentiment, even in Congress, where people are sick of the wars. 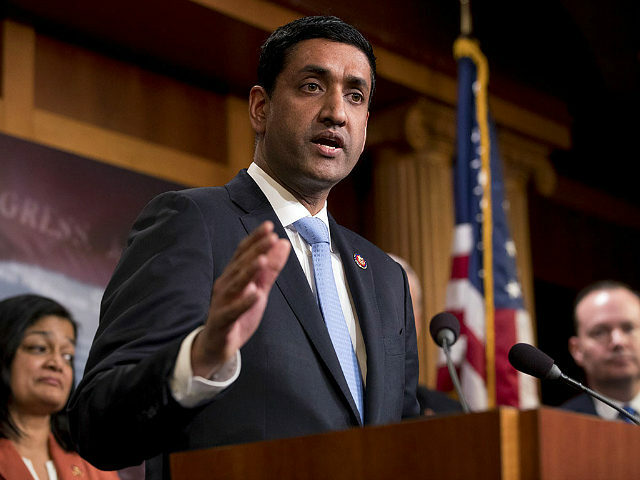 The primary effort that Khanna is leading in the House is a battle to end the U.S. backing of the Saudi-led coalition in Yemen’s civil war. The U.S. action started under former President Barack Obama’s administration, without congressional authorization, and continued under President Trump’s administration. The U.S. was refueling Saudi bomber jets — until the Trump administration stopped that, at least for now, under public pressure — and also has been providing targeting assistance to Saudi Arabia’s air force. Early last year, in the spring of 2018, a coalition in the United States of groups from both the grassroots left and grassroots right came together to back an effort in the U.S. Senate to pass a War Powers Resolution reining in the executive branch’s actions on behalf of the Saudi coalition in Yemen. The first time around, in early 2018, the effort failed, falling a few votes short of the necessary total to pass a War Powers Resolution out of the Senate. The then-GOP-led House would not consider any such resolution. But then later, on a second try in late 2018 after the midterm elections, the U.S. Senate passed the War Powers Resolution with a bipartisan coalition. It was historic. Neither chamber of Congress had until then passed a War Powers Resolution invoking the War Powers Act since the law’s inception in 1973. The law was passed in the wake of the highly unpopular Vietnam War as part of an effort by Congress to install another check on the executive branch so the president cannot enter or carry on wars without congressional approval. The founding fathers of the United States gave war-making powers to the Congress, as Article I of the U.S. Constitution clearly says that Congress has the authority to declare war — not the president. Sen. Paul, one of the Republicans who alongside Sen. Mike Lee (R-UT) led the GOP-side of the push, told Breitbart News when the measure passed the Senate that it was an “extraordinary moment.” Now, the Democrat-led House of Representatives has passed a War Powers Resolution on Yemen as has the GOP-led Senate this year — the Senate had to pass a new one in the new Congress — and the two chambers are working on reconciling the differences between their passed versions and are very likely going to send one to the president’s desk soon. Khanna said he hopes that President Trump will sign the War Powers Resolution when it gets to his desk — arguing that it would be a historic win for Trump as he would have accomplished something that has never happened before in U.S. history. Khanna also said that Trump could, by signing this, help brush aside Democrat criticisms of his adviser and son-in-law Jared Kushner’s security clearance and communications with Saudi crown prince Mohammad Bin Salman. The War Powers Resolution fights over Yemen in the U.S. Senate and beyond have brought together a unique coalition unlike anything else in U.S. politics. Groups as diverse as FreedomWorks and Code Pink, or the Charles Koch Institute and Win Without War, as well as lawmakers as different as Bernie Sanders and Mike Lee or Ro Khanna and Mark Meadows, have been working together building trust with each other for over a year now. While these people usually are working against each other on any given issue and digging into their respective partisan trenches on everything from health care to immigration to taxes or anything else, as they have seen victories on Yemen in the Senate and in a general change in the Trump administration’s approach to the Yemen civil war, trust has built throughout the movement. As that trust has manifested, the arena of foreign policy issues at least some of these folks have been working on has expanded beyond just Yemen to working towards a broader foreign policy vision for the United States that pushes for an end to wars in places in like Afghanistan and withdrawal of U.S. troops from Syria — as well as support for peace negotiations with North Korea. Khanna specifically noted that he met with former President Jimmy Carter ahead of Trump’s second summit with North Korean dictator Kim Jong-un and that he backed the president on the meeting with the North Korean leader in a push for peace. He also cited Afghanistan, Syria, and wariness by many of potential U.S. military intervention in Venezuela. Overall, it’s a new vision for U.S. foreign policy emerging with broad populist bipartisan support. Days after all this, Trump would go on to crush Bush — and all his other opponents — winning the South Carolina GOP primary by more than ten percent over the next closest finisher Sen. Marco Rubio (R-FL). Jeb Bush dropped out of the race that night. But Trump is not the only candidate that year who was pushing stopping the foreign wars: Sanders was too, and while Sanders did not make it past Clinton in the Democratic primary, the energy behind him from the left’s grassroots was a major theme of 2016. Now that Sanders is running again in 2020, ending unnecessary U.S. interventions worldwide is again a major theme of his campaign — and Khanna, a co-chair of his campaign helping Sanders’ policy framework, is a driving force of that. Khanna said in his interview with Breitbart News that he noticed when he introduced Sanders in Chicago at a rally in early March that the crowd cheered most loudly during his speech for saying Sanders would end unconstitutional wars. This is the first part of Rep. Ro Khanna’s exclusive interview with Breitbart News. More are forthcoming.